So, last time I shared our new home on here, you all got to see the UGLY and the neglected. The house that we kind of fell in love with and kind of saw potential in. Fortunately, the price was right (well it’s never quite right, but good enough) and we knew it was the next step to being able to achieve our dream home. We decided to work with the bones of the house and alter what was there and then add an addition off the back and a bonus room upstairs. We knew with the additional square footage and the re-working of the existing house the house could have all that we needed in a home. An open floor plan, lots of windows, fireplaces, front porch, jack and jill bathroom for the kids, a great master suite, and tons of storage and quirky details that would make this home one of a kind. I have always had a love for vintage homes but I appreciate the layout of modern homes too..especially for young families. I knew having this house I wanted to accomplish both. A modern flow but also have details like vintage tiles and old world charm to bring the love of vintage to the space. So I guarantee you’re wondering are we going farmhouse on this home. Well, the answer is YES, but I’m saying European Farmhouse! Lots of French charm, warn wood, vintage pieces, but with elegant character that you would see from old homes over seas. There will be a bit of modern touches too and I am sure as we go along the style will be tweaked and changed as we grow our roots here. So, I’ve got a lot of decorating to decide on as well as finishes and if you’re following me on IG you probably have seen some of these decisions or ideas…but if not I will be sharing them here as we go. Today I want to introduce our official floor plan to you all. 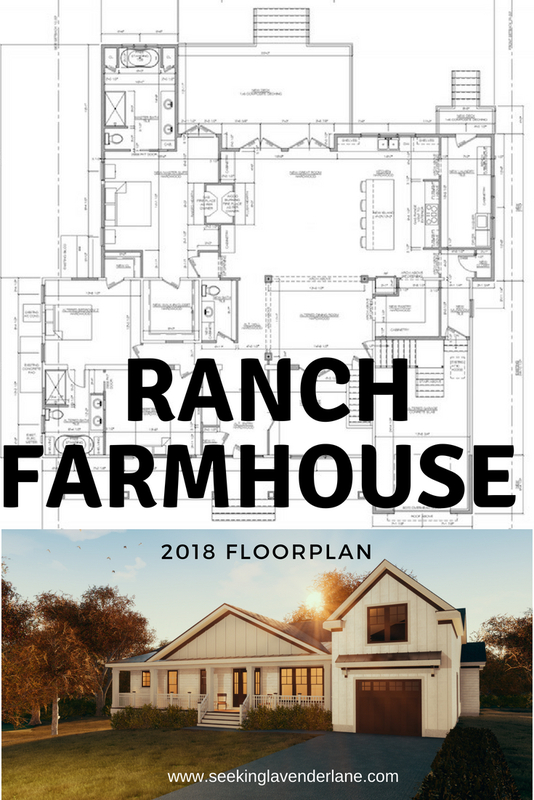 I think the plans for the house truly embark a 2018 Ranch Farmhouse Floor Plan. I still can’t believe the house we bought is able to look this way. So, the floor plan was a little bit of combined effort of my husband, myself, and our architect. We knew what we wanted and what we could and couldn’t have. Our budget was stretched a bit and then it had to be adjusted again when our appraisal came in much lower then what we had expected (though we know it will appraise for much more when it’s all done). So, there were a lot of sketches and late nights erasing lines and playing with the walls and design. I came up with the flow and the arched doorways and my husband came up with a refrigerator set into the wall and together with our architect and his team we saw our plans come to life! I think I cried the first time I saw our blueprints since all we were doing were assuming how to arrange the rooms..but once you see it in an actual real blueprint it totally blows you away. I couldn’t believe here we were designing our dream home how can I be this lucky? God is truly good and I know this was his design all along. So, here they are our blueprints and what our new home layout will be! A few of the details changed since this photo but I don’t have a cleaner version of the blueprints. They are the construction documents so I figured I would show you this. Nothing too crazy but I know our fireplaces had to be shifted and our pantry door was moved over a bit. This is pretty much though the overall idea! So, the front half of the house is the existing and the back portion where the family room, kitchen, laundry room, and master suite is all the addition. That will have vaulted ceilings and one day a deck off of it. As of now our budget is not covering the deck, so unless we don’t dip into our contingency fund we most likely will not have a deck for a little while. The Family room will have a wood burning fireplace and the Master suite will be gas. I am most excited for the kitchen as it will be our dream kitchen. I wanted to have it all open and insisted on not having an L shape. I felt it would feel more custom and special this way, and kitchen’s I have seen in this layout always catch my eye. We basically decided where the kitchen would be and then everything else fell into place. Another really important room for me, was to have a laundry room with a window. It will also be a mudroom too. I wanted it to be a place where the dog could come in and out of and be a place where the kids can hang their backpacks and coats after school. Though details like having built in cubbies will be what follows after the initial building. Our budget just won’t cover all of those upgrades but fortunately those are things we can always DIY and do over time. After all, I am going to need something to blog about over here! One of my other favorite details is the porch! I don’t think I could ever have a home without one. This summer I have been really missing our porch from our last house. I spend the warmer months on the porch in the morning, evening, and quiet afternoons. I can rock all day on a porch and feel like it’s my happy place. So having a porch this size is the biggest blessing! not to mention our private yard that I will get to enjoy it from. In our last house we had a busier neighborhood and the house across the street was much closer then here. Eventually when the landscaping is done and we can fix the yard up, it will certainly be lovely. So, one of the details we had to cut was the 2 car garage Our last house had a 2 car and this had an existing one car. We decided to bump it up so we could steal the back half for the house and also I wanted to give the house dimension. We initially planned to have a side garage but with the septic in the way and the property lines we just weren’t able to do so. We have talked about maybe way in the future adding a detached garage if we could buy the paper streets that separate the two yards. Though I don’t know when that will be so that’s a maybe one day thought! The Jack and Jill bathroom was important feature I wanted to have for my kids and then of course we have a basement and our bonus room upstairs! The basement will probably be one of those projects we finish over time but a great place for the kids to play when it’s all done. Also be hubby’s man cave down there! For me, having the bonus space above the garage is HUGE! It’s where I plan to have a creative space and do a lot of my painting projects etc. I hope having a space like this I can open up my home to workshops and be inspired even more. We chose to have a bonus room rather then a 4th bedroom. For our family we just don’t really need 4 bedrooms. Though I plan to have a pull out couch either in our bonus room or office space so when we do have guests there can be a place for them. We never had that in our last house and usually our guests would just crash on the couch. I’m glad at least our house offers that option this time around, but to have a permanent 4th guest room, I don’t see as being that beneficial. If you are wondering the bonus space will be directly above the garage. We will have stair access from inside the dining room, which at first I wasn’t super happy about but then I realized how unique that makes our house. Having stairs coming through an arch way from the dining room could be a really cool feature. I plan on making the stairs pop either all wood against some white walls or maybe even adding some wallpaper to the wall or stair treads. We will see! I plan to start creating some design boards too and sharing that with you all per room. Probably the first will be the kitchen since that will set the tone for the rest of the house. Thank you all for your sweet words and encouragement all this time! It has been so helpful through this process and I feel so blessed to not only have the opportunity to be designing our own home, but to also be able to share it here. It’s a surreal experience that I am grateful for everyday! Oh and our exterior 3D rendering too, if you missed it on Instagram! Though I have a few different finishes compared to this one that my architect created. Though I love it, I do plan to use no black and possibly a blue front door! I will keep you all filled in on that too as we get to making those final plans! Oh and what do you think of a pergola verses a tin room over the garage? My initial plan was the tin roof….but I also love the look of a pergola. Let me know your thoughts! How exciting. 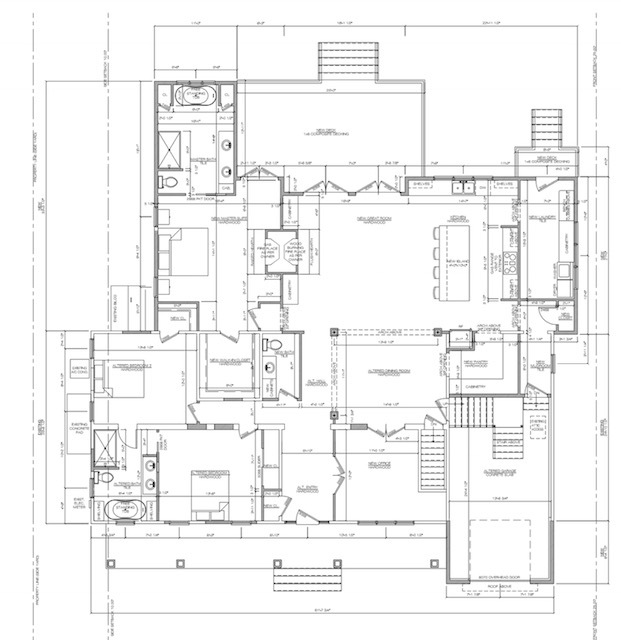 Love the floor plan, and can’t wait to see it all take shape. Thank you Marty! We are thrilled! Looks like it will be fabulous! Thank you for taking us along on the journey! It looks lovely! I’d love to see a sharper image of the plans!! I know, I don’t know how to get the image sharper. I think because I took it from a PDF I’ll just try to see if I can mess around with it some more. Thank you though! I love it! What a fantastic layout! Do you mind sharing the dimensions of the entire main floor? Just wondering how many square feet the main level is. Thanks! Sure, the entire square footage of downstairs is 2300 with the addition upstairs it will be 2700. Love! A small suggestion if you haven’t already planned for it. When we had our house built we added a gas hookup to our wood burning fireplace. It allows us to start a log fire faster with less smoke and should we choose at a later date to convert to gas logs we easily can. We literally made that decision when talking with the fireplace store the other day! Too, funny so worth it from what I hear. 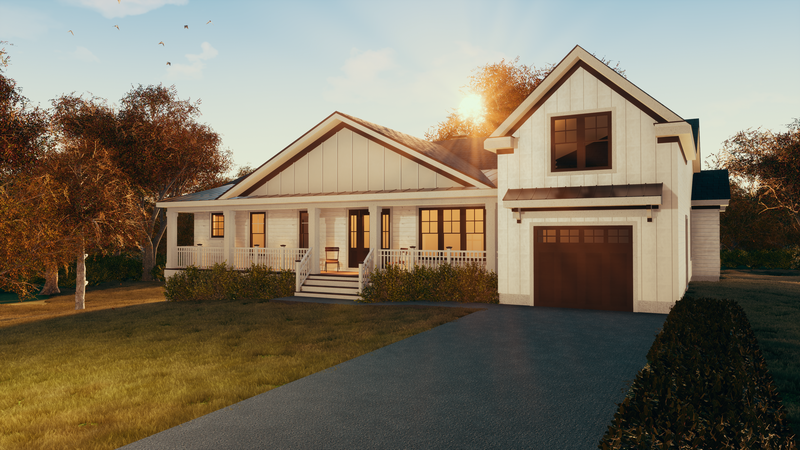 The 3D rendering of the farmhouse plan looks amazing! I’ve been looking for farmhouse inspirations and i’ve been to 5 different websites and yours is my favorite. Thanks for sharing this! Thank you so much Alaine, that means so much!